Today I received two 24 kilogram competition-style kettlebells from the American Kettlebell Club. I've been anxiously awaiting their arrival since I surpassed the "Rank II" level for amateur kettlebellers set by the WKC. I was pleased with what I got. They are uniform in size and shape, and the handles feel great in my hand. They look really nice; not quite the Rolls Royce quality of Leoko kettlebells from Finland, but I have to say that Leokos were the first thing I thought of when I took these out of the box. 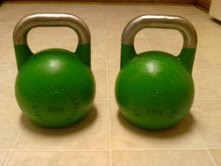 These are nice, quality kettlebells. I'm glad I bought them. As soon as I took them out of the box, I did a five minute set of Long Cycle. I averaged 7-8 reps per minute, and finished with 37 reps total. I'm hoping to make the 69 rep total I need to make my "Rank I" level in the next month or so. Judging by how tonight went, I think that's realistic. By the way, the American Kettlebell Club has a sale going right now (that made this purcahse possible) and they had very attentive and efficient customer service. I have no affiliation with these folks other than being a fan of their training methods and coaches. I'd recommend them to anyone considering buying kettlebells.